Cats love boxes and the best thing about them is that they come in various sizes. It is very easy to replace or recycle them when your furry pal gets bored playing with them. Cut them upside down and cut an entrance hole in them and windows for a fun little cat house. 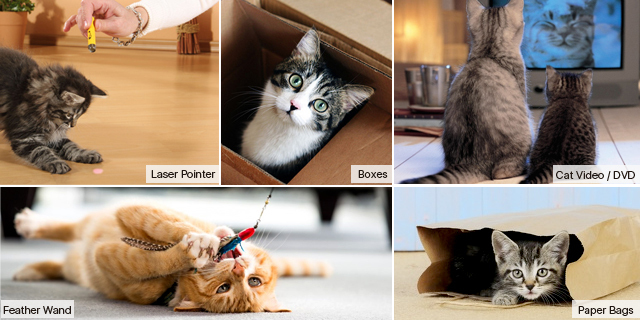 There are different ways you can use your creativity and utilize these boxes to entertain your kitty. Carefully scrutinize for any leftover peanuts as eating it by your kitty can result in choking. Laser pointer can be highly stimulating and interactive game that your kitty will enjoy the most. Even the laziest or oldest cat will enjoy chasing the laser dot across the floor, around furniture or on the wall. It can also be good for active young pets, although it can make them a little too active or hyper. Before getting a laser pointer conduct a thorough research. Also, never allow children to touch it. The rays of the laser should not enter the eyes of the pets. Ensure that all the safety precautions mentioned on the product label are followed thoroughly. If your kitty loves watching nature on TV get her cat videos on DVD. There are several videos that have been made specifically for cats. The great thing is that it will make your feline binge watch the program. It will keep her occupied for several hours. So why not pamper your precious princess by getting a cat video and see what happens!! The paper bag is one of the most recognized cat toys. Avail these bags from grocery stores without incurring any cost. Your kitty will pounce on it, crinkle it, rip it apart, poke through it and even chew it up. When this happens, you know it is time to replace it with the new one. You can even hide your kitty’s favorite toys in the bag so that she finds it interesting to find them. You can even play different games through the paper bags. Cats have hunting instincts that can satisfied through feathers. There have been several substitutes in the market like stuffed birds and mice, but nothing can be compared to the real thing. Cats have special liking for feathers. Utilize a feather wand (a collection of feathers attached to a stick or handle) to attract your buddy. There are certain feathers like peacock feathers that are approximately 20″ long due to which they are not required to be connected to a handle. You can just hold the feather as a want and the great thing is it is a big hit amongst cats. Note: When you play with the feather wand, let your kitty catch the feather once in a while as it assists in building her self-confidence, but don’t do it too often because that will make her lose interest in the feather. So which of these toys and games are you planning to play with your kitty?